Are you experiencing the frustration that many homeschool parents feel when trying to teach algebra to their teen? Alpha Omega Publications has a solution that you're going to love! It's the LIFEPAC Algebra I Set. In this mastery-based math program, your student will focus on mastery of a single skill, and then move on to learn new concepts, laying a foundation for ever-increasing levels of proficiency. In LIFEPAC Algebra I, your student will study concepts such as: variables, signed numbers, solving inequalities, solving word problems, addition, operations with polynomials, binomial factors, radical expressions, irrational numbers, graphing lines and inequalities, graphical solutions, and much more. 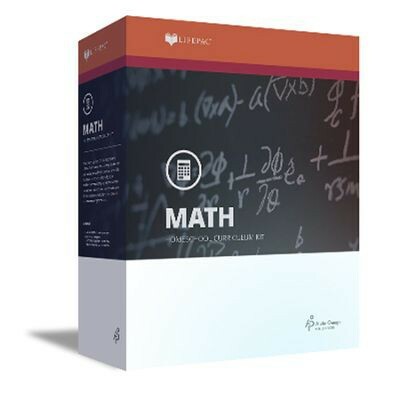 In the LIFEPAC Algebra I Set, each student worktext includes daily math instruction and review, as well as plenty of opportunity for assessment of student progress. In order to encourage individualized instruction, included is a teacher's guide designed to help you guide your homeschooling student's learning according to his specific interests and needs. The helpful Alpha Omega curriculum teacher's guide includes detailed teaching notes and a complete answer key which includes solutions!